Pasta lovers will get their money’s worth here. Fresh pasta in a hollowed out Parmesan wheel, gratinated or in a classic buffet form. A difficult decision … no problem – with our pasta concept you have the opportunity to try all three types. 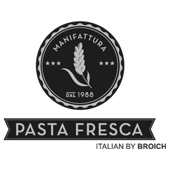 Different varieties of traditionally made pasta from our own pasta factory. A selection of antipasto and dolce perfectly round off the concept. | Advantage of this offer: Fresh homemade pasta. From savoury to sweet, there is something for everyone’s taste.